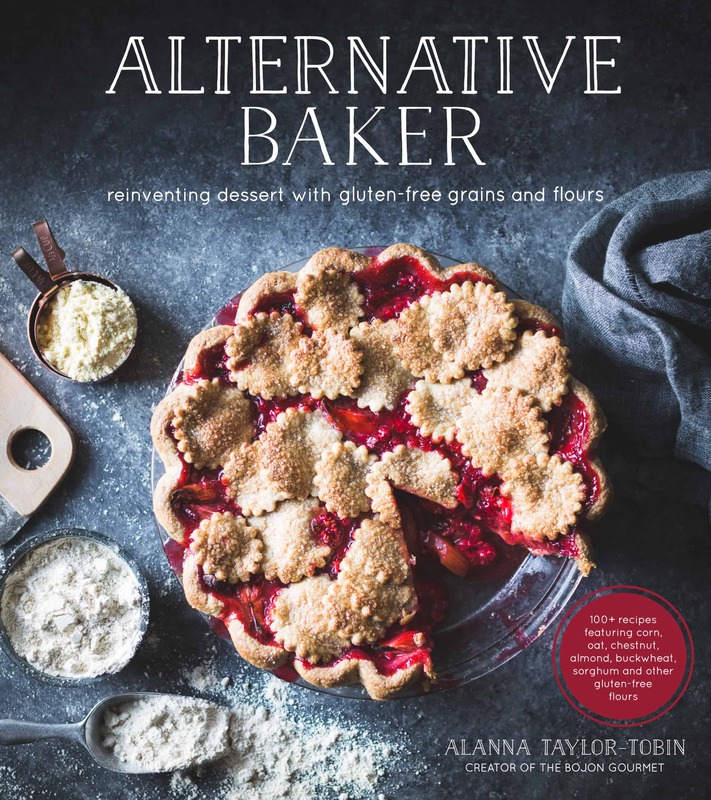 I’ve been dreaming of a vegan version of the chocolate truffle tart in Alternative Baker since I turned in the manuscript nearly 2 years ago, and I’m excited to (finally!) be sharing it today! So why did it take me so long to make this creamy, chocolatey dream a reality? As with many things in this life, I found myself in analysis paralysis as to veganizing the recipe. I knew from experience that the cocoa almond crust from the book would work using non-dairy butter. I’m obsessed with Miyoko’s non-dairy butter, which is made from cashews and coconut oil, and manages to taste even better than dairy butter. I can eat the stuff with a spoon. But the filling was another matter. The chocolate truffle filling in Alternative Baker is essentially a ganache with an egg added to make it custardy. 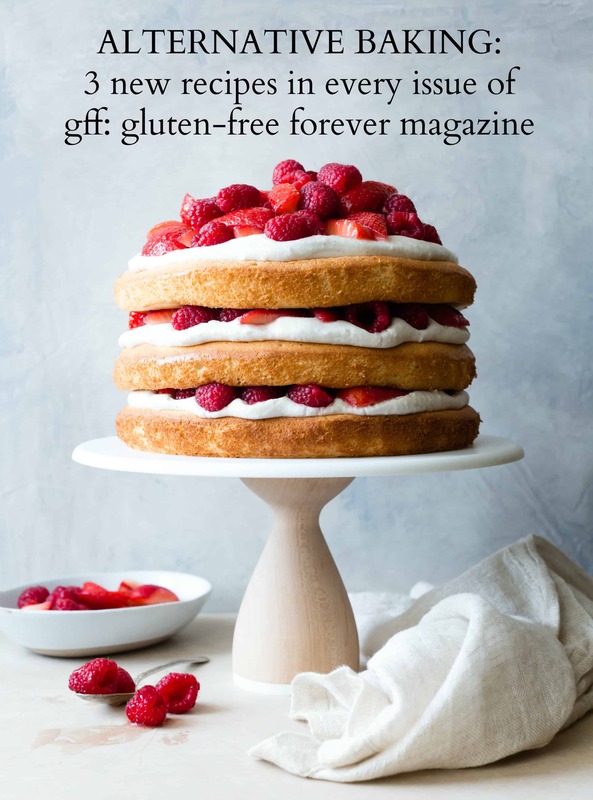 It’s flavored with fresh bergamot if you can find it, or earl grey tea if you can’t, and it gets finished with a swoop of whipped cream, a drizzle of fruity olive oil, and a pinch of flaky salt. It’s one of our absolute favorite desserts in the book. During testing when our kitchen was overflowing with sweet upon sweet, it was the one treat that Jay hoarded in the fridge, refusing to give any away, savoring bite by bite until it was finally gone a week later. 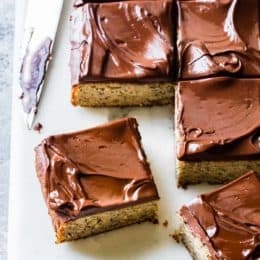 For the vegan version, I knew I could swap the cream in the ganache for coconut milk, but how to replace the egg? Eventually I gave up on a traditional custard and decided to try a soaked cashew base set with coconut oil and chia seed and sweetened with maple syrup. It worked like a charm. I made the first iteration on New Years Eve Day in a frenzy of tying up loose ends. 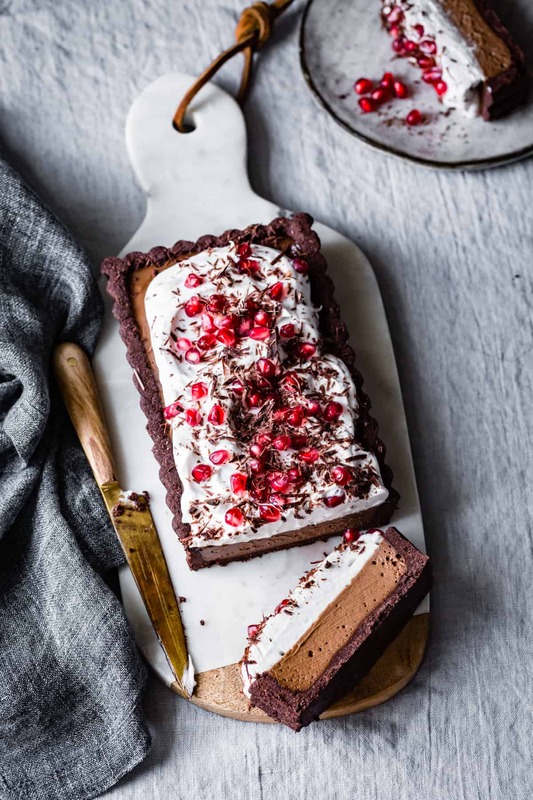 “I’ve wanted to make this tart all year – resolutions be damned!” I thought as I pressed cocoa crust into tart pan, ground chia seeds in a coffee grinder, and pureed filling in my trusty blender. When it was set, I ate a slice on the couch feeling that the year was, in a sense, complete. 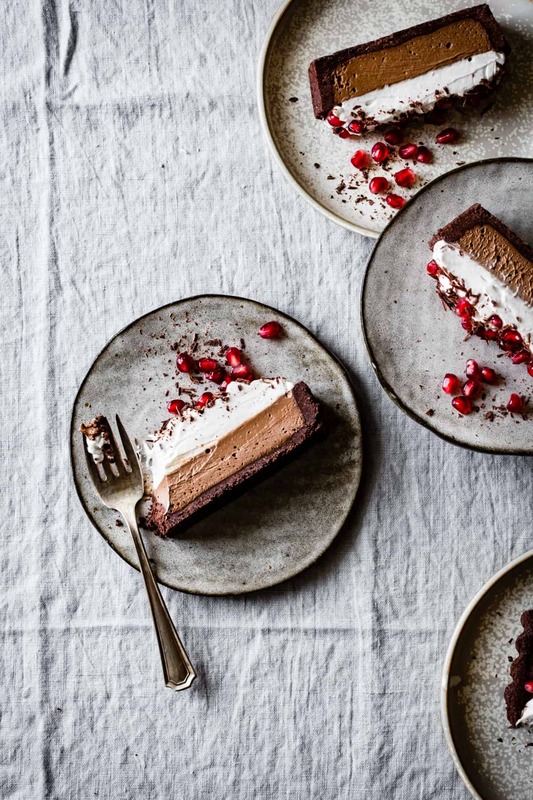 The crust of this chocolate cream tart tastes like really good Oreos thanks to Dutch-process cocoa powder, almond flour, and just the right dose of salt. A thin coating of dark chocolate creates a barrier between filling and crust, helping to keep the crust crisp. 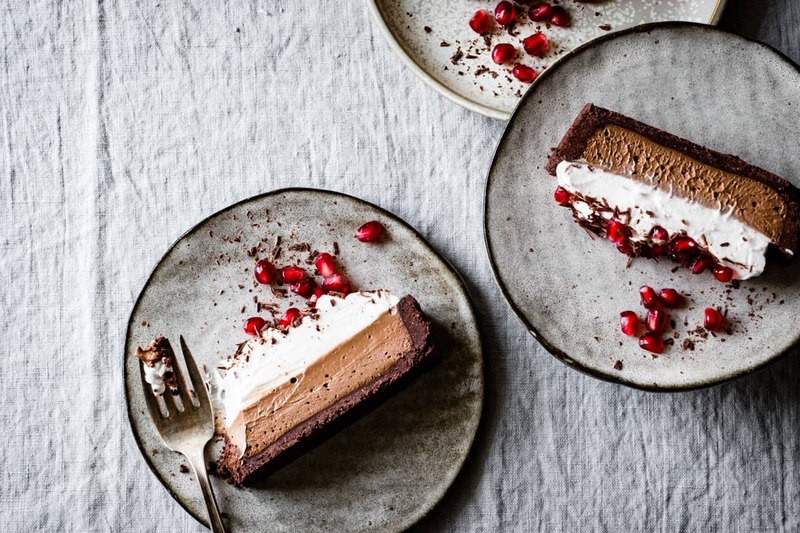 The filling sits somewhere between pudding, mousse, and cashew-based vegan chocolate cheesecake, with a deep chocolate flavor from natural cocoa powder and mild sweetness of maple syrup. 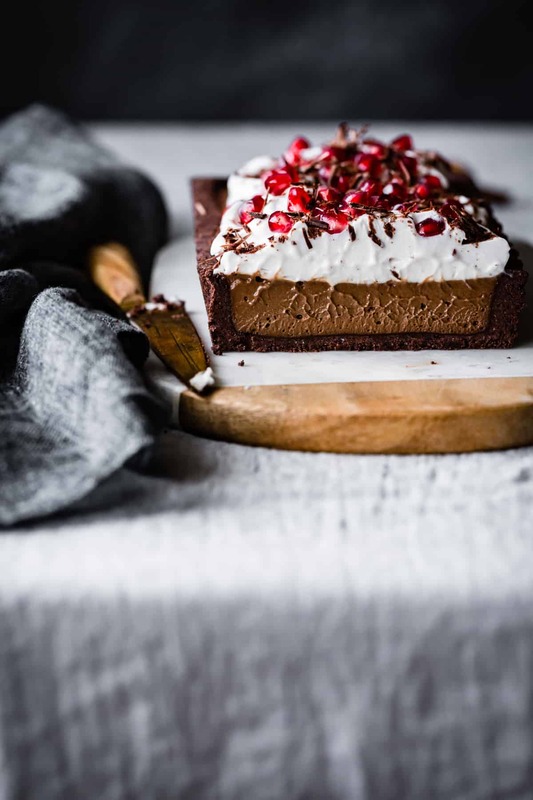 Whipped coconut cream creates a mild counterpoint to all that chocolatey goodness, and chocolate shavings (and pomegranate arils, if you’ve got them) pretty it up. 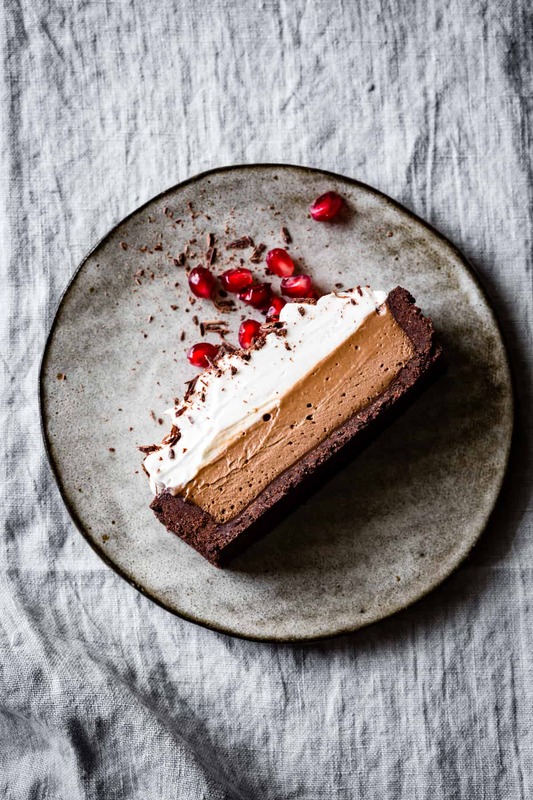 Since I couldn’t leave well enough alone, I also made a grain-free version of this chocolate cream tart using a no-bake crust of almonds, cocoa powder, and maple syrup. The classic flavor and crisp crust of this baked version is my favorite, but I’ll share the grain-free version tomorrow. Stay tuned! 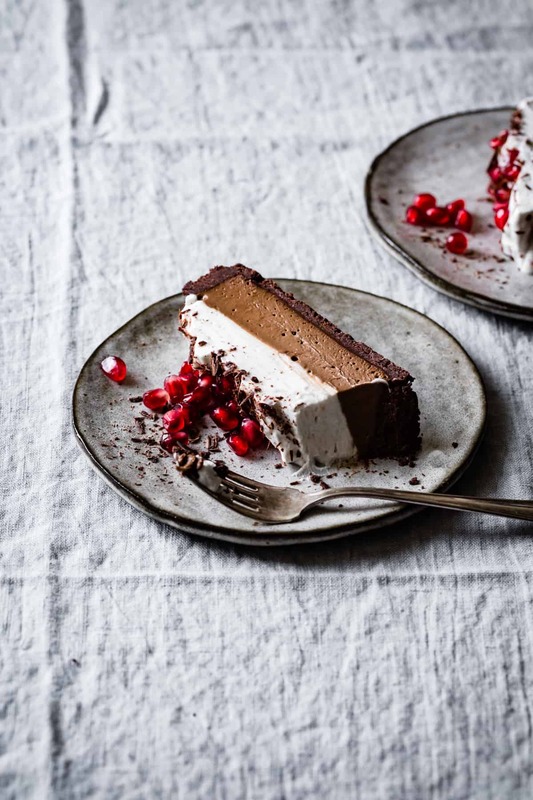 For the best flavor, I usually make the crust with dutch-process cocoa powder and the filling with raw cacao powder or natural cocoa – I usually have all three lying around (I’m weird). But the recipe will absolutely work using just one type of cocoa if you prefer, so take your pick. The filling is mildly sweet, so feel free to add another tablespoon or two of maple syrup to your taste. The chia seed in the filling helps it emulsify and thicken; if you don't have access to chia seed, flaxseed will *probably* work, it will just have a more pronounced flavor. I buy whole chia seeds and grind them finely in a coffee grinder, then measure out 2 tablespoons of ground seeds. 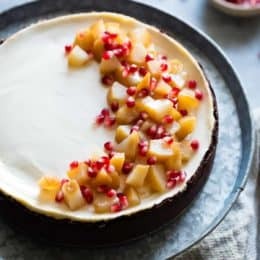 Pomegranate arils on top add a fresh pop of color and flavor, but if they aren’t around, the tart is lovely without them, too. Or top this tart with fresh berries in the spring and summer. Dump about half of the crumbs into a 5x13-inch rectangular loose-bottom tart pan (or 9-inch round tart pan) and press evenly into the sides of the pan. Add the remaining crumbs and press evenly into the bottom – it usually takes me about 10 minutes to make it look pretty. Place the pan on a rimmed baking sheet to catch any drips and bake until slightly puffed and firm to the touch, 20-25 minutes. Remove the crust from the oven and, while it’s still hot, press the sides and bottom with the back of a spoon. This will help it hold together when cool. While the crust is still hot, scatter the chocolate in the bottom and let sit a few moments to melt. Use the back of a spoon or an offset spatula to spread the chocolate over the bottom and sides of the crust. Let cool completely. In the bowl of a blender (preferably high-speed) or food processor, combine the soaked and drained cashews, cocoa powder, ground chia seed, maple syrup, water, salt, and vanilla. Blend until very smooth, starting on low and gradually increasing to high, about 2 or 3 minutes in a high-speed blender and longer if needed. Add the coconut oil and blend briefly until smooth. Pour the filling into the crust; you’ll have about a cup left over to chill and eat as pudding. Chill the tart until firm, at least 4 hours and up to a day or two. This looks really beautiful and sounds delicious. I’m wondering if I can use black chia seeds in lieu of the white, which are much harder to find where I live. I read online that there is no nutritional difference, it’s purely aesthetic. Will the black chia seeds leave little specs in the filling? I think black chia seed would work just fine! How important is the Chia seed to the recipe? It helps the filling thicken and emulsify, but it would probably still work if you left them out. This looks amazing! I had a major craving for chocolate mousse on NYE, and I ended up making small serving of coconut milk chocolate custard. I added agar agar powder to let it set, and it worked beautifully. Have you used agar agar in your baking? Also, I always wanted to ask, can I be your recipe tester please? :) We can have cat play date! Aw, a cat playdate sounds lovely, as does that custard – yum! I always have trouble getting the agar flakes to melt. I’d love to know more about your technique! I used agar agar powder, which is more concentrated than flakes I believe. I simmered full fat coconut milk with cocoa powder and a bit of agar agar powder until powder dissolved and let it cool in the fridge. There is a famous Russian cake called ‘bird’s milk cake’ I would like to attempt baking at some point. Ah, agar powder would be so much easier! 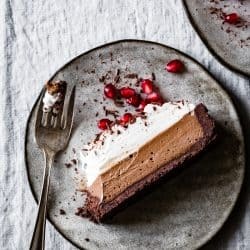 I actually have a really old raw chocolate pudding recipe on this site that uses it: https://bojongourmet.com/2010/04/raw-vegan-chocolate-pudding/ That cake looks amazing too! So in love with your website! So many of the sweets I make come from here. 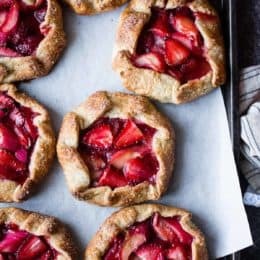 I am wondering if using organic unbleached white flour (Bob’s Red mill) in place of the GF flours will work in this recipe? I think you could probably use wheat flour here, I’m just not sure how much… please let me know if you try it out! Oh my goodness, this was spectacular. The crust didn’t have that familiar ricey GF texture or flavor, but instead it was melt-in-your-mouth crumbly and delicious. The filling was lovely—I used whole chia seeds because I couldn’t figure out how to grind them and they were just fine. You’d never know they were in there. What a glorious dessert! My whole family loved this and I will make again and again for sure! Next time I’ll try adding less coconut oil to see if I can cut calories. Thank you so much for this wonderful recipe! Thanks so much for trying my recipe and for the sweet note! I’m so glad it was a hit. I think you could reduce the coconut oil a bit and still have a sliceable filling. Let me know if you give it a try! OMG! I just made this….haven’t let it set yet…eating the left over pudding and absolutely LOVING it! Smooth, creamy, delicious. I made a simple crust using hazelnuts, cocoa, dates and a little water. I’ll post again after I try the set torte with cream….just couldn’t wait to say how much I was enjoying the pudding. 👍🏻❤️😃🙏🇨🇦 Thank you for sharing the goodness! Aw! Thanks so much for trying my recipe! I can’t wait to hear how the finished product turns out. That crust sounds amazing!! Ok… I made the cream and tasted ( gobbled ) the completed recipe. Absolutely fantastic. I looks fabulous, is smooth, great tasting and no diary or refined sugar bloat. EVERYONE will LOVE this! Thank you again for sharing. I give it 5 stars! Wondering now if I can adapt and create a butterscotch filling using dates. OMG, love that idea!! Please let me know if you try it! And I’m so glad you loved the tart – yay! I was wondering if you think this will freeze well? I don’t know for sure but I think it might! I would freeze it without the coconut cream topping. Thanks! I made it and just added some cardamom to the filling. It was delicious. Could I use Bergamot essential oil? Just a drop? 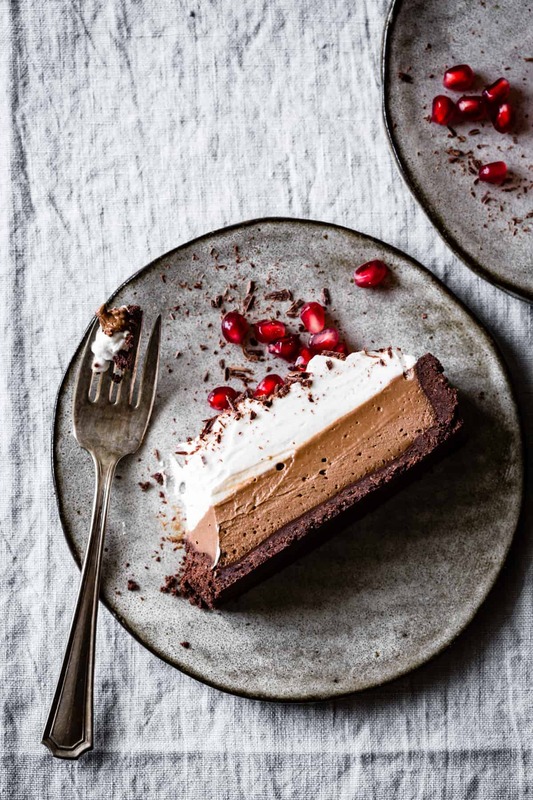 I have been making this as a pudding since I took a raw class a few year ago and I use a combo of avocado sbd dosked cashews – I love the idea of a cooked crust as the raw one was a bit heavy – can not wait to make it! I just wanted to say what an amazing chocolate tart! I made and brought it to Thanksgiving dinner and it was an instant hit. Friends were a little dubious about the gluten free/dairy free but were surprised how delicious it was. Only problem was there wasn’t any left to bring back home. 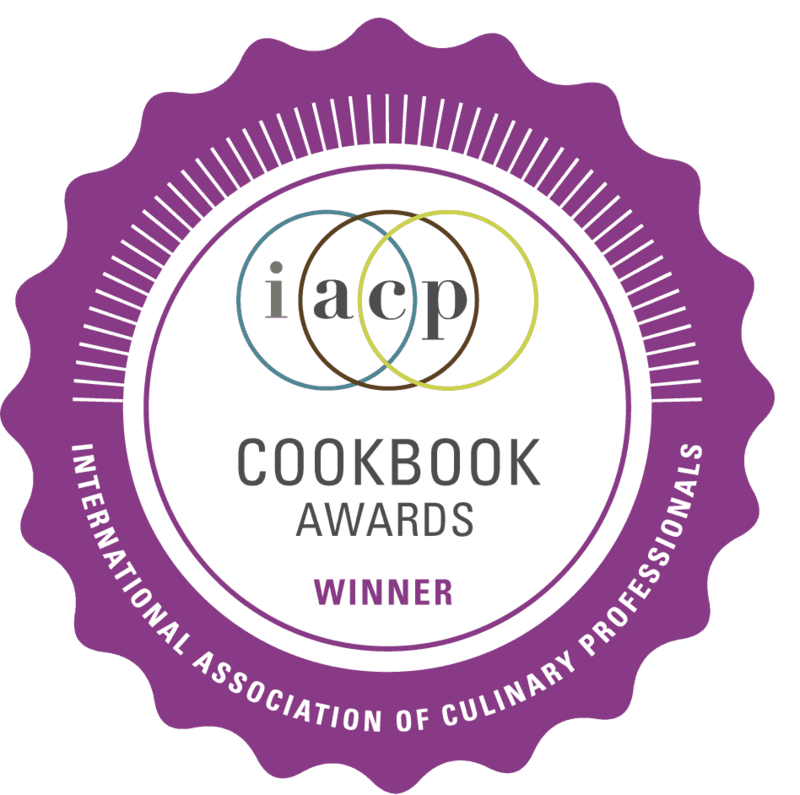 Thanks so much for your collection of recipes that are delicious, healthy, and beautiful. I appreciate your well thought-out process of crafting the perfect gluten free chocolate mousse cake that is vegan and GF. Lucky us who just need to follow your instructions step by step! One question, I am avoiding coconut oil in my diet. May I use simply olive oil (liquid) in making the crust? And also replace coconut oil in the filling with olive oil? Is tapioca starch essential? May I omit it or use something else more regularly found in my pantry? Thanks so much!!!! I love your recipes!! Thanks for the kind words Nicole! So for this tart, the coconut oil solidifies the filling because it firms up when chilled. I know olive oil is also fairly solid when cold, but not to the degree that coconut oil is. I wouldn’t recommend substituting it here for that reason. Also I think the flavor will be overly strong. For the crust, you could use cornstarch in place of tapioca flour; the crust may be more crumbly however. Thanks a bunch for reading and for the great questions!